As graduation nears, Ivan Suminski ’18, ’18E finds himself in an enviable dilemma. The paths he could follow are manifold. Should he apply to graduate school to continue his violin studies? Or to research the biophysics of the inner ear? Or should he instead apply for an engineering job, knowing a company would likely pay for him to go to graduate school later? 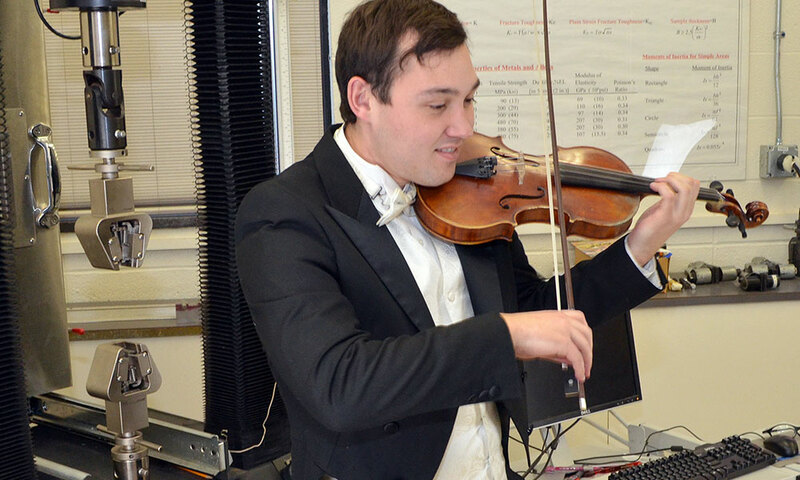 All are valid options, thanks to the mechanical engineering and violin performance degrees he has been working toward simultaneously through the University of Rochester’s Dual Degree with Eastman program. Nothing about the program, moreover, precludes Suminksi from pursuing his “absolute dream job.” Ask him what he’d most like to be doing 15 years from now, and there’s no hesitation. “In an ideal world, I would be performing as part of a string quartet,” the native of Traverse City, Michigan, says. Suminksi is representative of many Rochester students. The University puts a premium on interdisciplinary studies, and the University’s dual degree program is one way students can pursue them. The dual degree program started in the early 1980s with just a few students. Now, there are almost 100 students pursing degrees from both Eastman and the College. “We’ve seen an explosion in the size of the program in the last few years as more and more students come to us with interest in two or more fields,” says John Hain, Eastman’s associate dean of academic affairs. “In the past, the program often provided a safety net for music students who wanted a backup plan in case their music career didn’t work out, but more and more we’re seeing students who have a genuine interest in both majors. “The majors really run the gamut—almost every major at the University is represented in the dual degree program,” Hain adds. He notes that English, math, and biology are especially popular in the School of Arts and Sciences, as are audio and music engineering, mechanical engineering, and computer science in the Hajim School of Engineering and Applied Sciences. The dual degree program was a perfect fit for Suminski, whose attraction to both music and engineering is rooted in strong family ties. His mother’s father earned a bachelor’s degree in mechanical engineering, a master’s degree in electrical engineering, and a doctorate in agricultural engineering, which he then taught at Michigan State University. Suminski remembers his grandfather’s reaction to some of his school assignments. “Even in elementary school, when I had to do Rube Goldberg-like projects, he would have suggestions. ‘Ooooh, you could complicate it even more by doing this,’” he recalls his grandfather saying. Without a doubt, Suminski’s academic program is demanding. 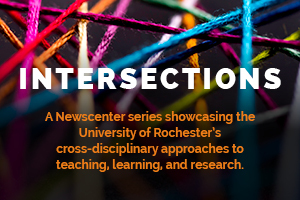 Rochester’s accredited engineering curricula includes a heavy load of required courses, which must be followed sequentially, leaving little “wriggle” room to fall behind. In addition, it culminates in a senior design project that can be time consuming. In the meantime, to prepare for the senior recital required for his music performance major, Suminski practices the violin two to three hours a day—while also playing six hours a week in orchestra, taking lessons, and completing classes in theory and history. Suminski has excelled. In December, the Hajim School awarded him a Wells Award, given annually to the two Hajim School students with minors, dual majors, or dual degrees in humanities who had the best overall grade point averages at the end of their junior year. Suminski also has found time to serve others. Since his first year at the University, he’s been active in the University’s Catholic Newman Community. This past spring, he organized and led a service trip to Frenchville, Pennsylvania, to help elderly residents with yard work and other chores. “Some had had really bad experiences trying to go into nursing homes and as a result were fiercely independent, but still needed help just living on their own,” Suminski says. A good professor can make the “uninteresting,” interesting. “The class that I was not expecting to enjoy, and then really enjoyed, was music theory,” Suminski says. Eastman’s Henry Klumpenhouwer wielded both humor and “a great way of explaining everything” to turn a potentially dry topic—German harmonic theory—into one of Suminski’s favorite subjects. While seeming disparate, engineering and music majors complement each other. For example, as both a violinist and an engineer, Suminski is intrigued with the research that Jong Hoon Nam, an associate professor of mechanical engineering, is doing on the biophysics of inner-ear sensory cells. And it was equally interesting for Suminski to have an internship this past summer with a company that produces musical accessories—including violin strings. That’s one reason playing in a small ensemble is a dream. “That wouldn’t even feel like work to me,” he says.